Me Jewel and Darlin’ Dublin. | Come Here To Me! Me Jewel and Darlin’ Dublin. There was a great reaction on our Facebook page to Alan Wall’s brilliant recent Le Cool cover, featuring some iconic Dublin images. Over 100 likes, and 27 shares, indicated that many Dubliners took to Alan’s tribute to the city. Alan sent on this image below, which shows even more classic Dublin features. 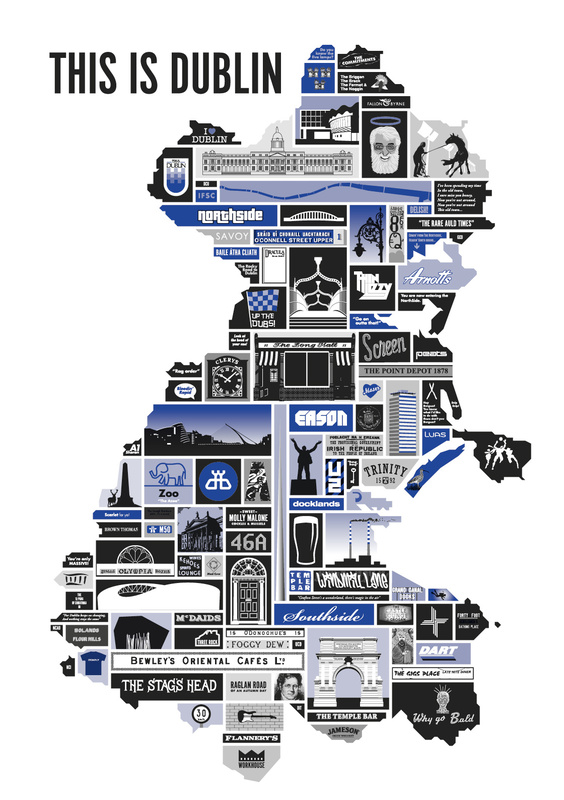 This image is available to purchase in poster form from dublinposter.com. A few of my favourites from the image are Ronnie Drew (shown here as a saint! ), the logo from Dublin’s ‘fake’ millennium in 1988 and the classic Why Go Bald? sign. Do you know the five lamps? – a phrase that always baffles country folk and pseudo Dubs. Congratulations to Alan, the poster is gorgeous.